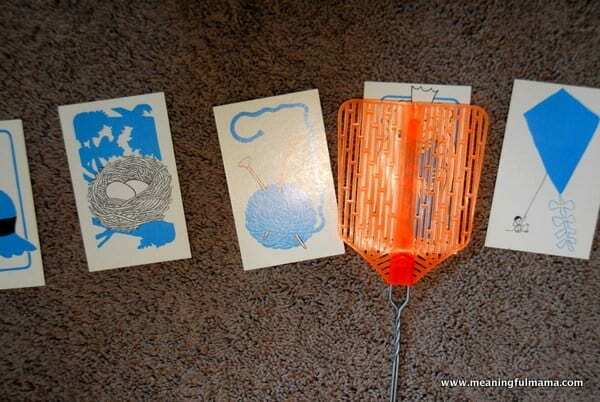 Fly Swatter Learning Slap is a learning game that can be adapted for all levels and subjects. It works really well for your kids with high energy. Kenzie was working on her letter sounds. We did this activity two ways with her. 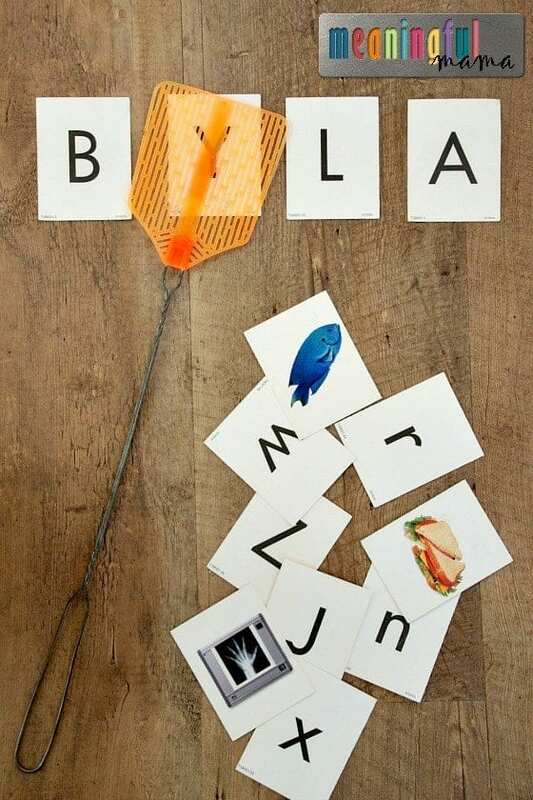 You will need simple flash cards for whatever skill you are practicing. You can make your own or buy some. They sell them at the Dollar Store, so I would go that route. 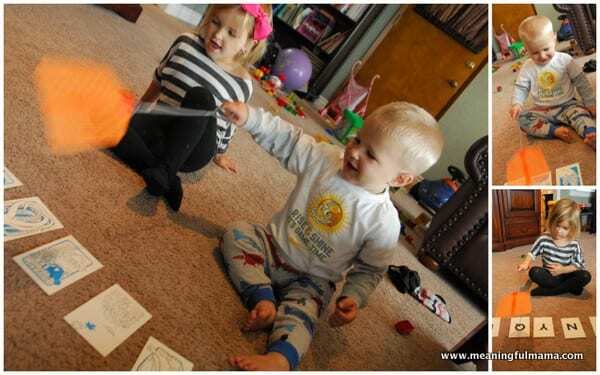 You can do this learning game for math facts, sight words, foreign language words, letters, sounds, capitals, etc. One way we played this (pictured above) is she would need to slap the letter that matched the sound I made. The other way we engaged with this activity (pictured below) is that she would need to slap the picture of the sound I made. So if I said “Nnnn”, she’d slap the picture of the nest. My littlest also was able to join in the fun. We are working on vocabulary with him. He is almost two, so his word knowledge is growing quickly, and we can help him gain more language as he is developing. For him, I had him slapping the picture of what I said. So, if I said, “Slap the queen.” He could hit it. He picked it up quite well, and smacking things is right up his alley. Older kids, of course, can be working on their math facts of vocabulary words. This is one of those activities that can be adapted for all age levels and abilities. As a former teacher, I know the benefit of attaching movement and learning. This is especially true for younger kids and those kids who struggle with dyslexia, autism or a number of other learning challenges. When we can tie in a variety of senses, kids benefit from connecting different parts of their brain. If you have no background in teaching, you can still be an active part in your child’s learning. Look for fun and engaging activities that are easy to do, and you will see tremendous growth. Love this. One of my boys (twins) is pretty high energy and always on the move…this would be great for him. I can use our picture flashcards to work vocab. Thanks for another great idea!